Can you accept the world today "just the way it is"? In spiritual circles, that can be a trick question because so much work is presented as a way to heal the painful perspectives of the past by finding the gift in a situation and bringing that gift (along with your presence) back into the present moment. Accepting things as they are and trusting that everything has a reason can be helpful in healing the past, but also dimming the heart fire that calls us into action for our collective future. When I studied at the Four Winds Society, I was encouraged to dream with the same regularity as a meditation or yoga practice. If you do not consciously dream the world into being, you can be swept up in someone else's dream or someone else's nightmare. If you take a quick soulful inventory, how much of your individual life feels like a manifestation of your conscious intent? Looking at our shared reality of humanity on this earth, how much of the world feels like an expression of our collective dream? Is there a calling to re-imagine the world we live in, starting in your own life? I've had a wise, wild and free few weeks since our last new moon solar eclipse. We had a powerful Qoya Retreat at the Multiversity 1440 in the redwoods where we focused on doing our sacred work by dancing with the quote by Khalil Gibran, "Work is Love Made Visible." How do we become vessels for unconditional love to live in the world through the way we embody and share it? How do we find the courage to become visible? Luckily, we had good teachers. You can't get much more visible than a 400-foot redwood tree. We honored the underground connection of the redwood trees as a point of inspiration to become even more reverent of how we are all connected above ground as well. After an inspiring week of dancing, ritual, and exploration of our sacred work in Santa Cruz, California, I traveled to the sacred land of Taos, New Mexico to share Qoya as part of a workshop facilitated by Anne Davin, PhD and Robert Mirabal. 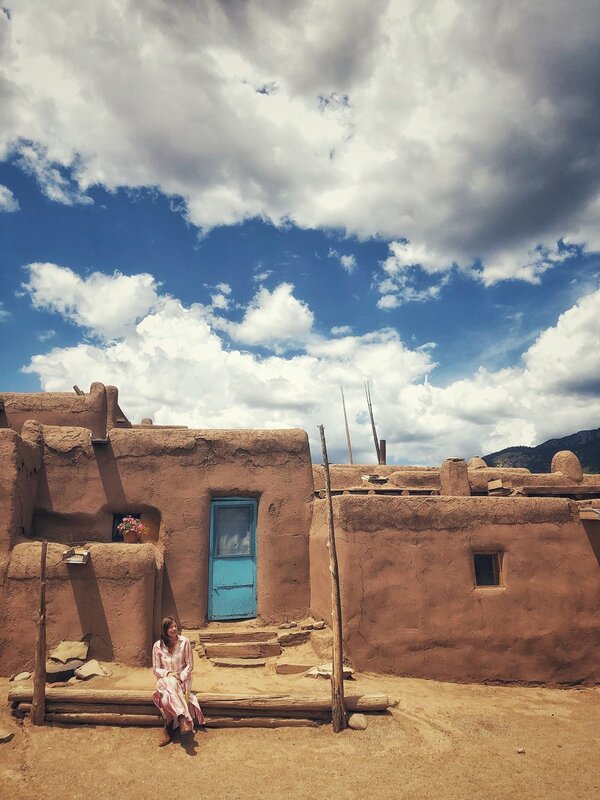 Taos Pueblo is considered one of the longest continually lived in communities in the United States, going back over 1,000 years. This is the fourth time I have been a participant in Anne and Robert's workshop and each time I have felt a humble and profound opportunity to harvest back parts of my soul so that I may plant seeds back to the places where I live and love. When asking about how to navigate this current world's systemic problems of injustice, a phrase emerged from Robert, "be better, not bitter." Anne's encouragement was to, "court the sacred back to the places where there has been pain." The takeaway for me is to continue to imagine the world embodying a lifestyle of reverence and find those places where my internal oracular activism that holds that vision can meet with my hands that take action to help build it. After the workshop with Anne and Robert, I spent an extra couple days in the Taos Earthships for a Qoya Teachers Gathering led with Samar Ocean Wolf Ciprian where we explored the pillar of circling and our relationship to water. Some people asked, "Why are you going to study water in the desert?" For me, it was so clear; in places where clean water is scarce, it is seen as sacred. My favorite thing about staying in an earthship is their reverence for water. Each drop that is captured from the rain is used 4 times in the house. The first cycle is for the drinking or bathing water, then for washing dishes or clothes, then for the toilet, and finally to water plants. I love being in places where someone stretched their imagination beyond what has been considered normal, especially when normal is unnecessarily wasteful. Circling in Qoya is a place where it doesn't matter what it looks like; instead, we look for the place where it feels good to open the body. We introduce the idea that our body is around 70% water and so is the earth, and invite the class to imagine reclaiming the element of water in our movements as we flow from one circle to the next. The highlight of our retreat happened when we went outside and did a water gratitude ceremony in which we each brought water from a place that was sacred to us and made offerings of water into a vase with stories of gratitude and appreciation for times when water has been there for us to heal, cleanse, connect, commune, when it has been an interface with our joy and our solace. As we were all buzzing in the field of resonant embodied appreciation for water...it began to rain all around us, but not on us. We were in awe. Who could imagine such a thing? What else is beyond our imagination? The Full Moon in Aquarius on July 27, 2018 (4:20pm EST) is a Total Lunar Eclipse. A blood moon, the longest in this century, as the moon turns red in the shadow of Earth for a total of 83 mins. Basking in the shadows, it is normal to feel extra emotional. Stay awake to the sensations. This is an activating moon, a time of unrest. The stirrings of the future are blowing in the winds. Dissent. Not a moon of compliance or civility, authenticity and honesty demand that we rise up. Revolt. Reinvent. Make change. We are prompted to defend what we most love. To balance the personal and the objective. Our differences are highlighted. Ideologies clash. We can be allies and not be friends. We can let go of relationships that contain too much friction. We can stay in our hearts and stand in our truth. We can connect with those who are accomplices to our truth. We are learning how to adapt and form interdependence. Things are not in perfect working order. We feel the real versus the ideal. Loss brings us longing: for forgiveness, for a better world, for higher love. This moon is peculiar, yet highly creative, launching us into futuristic chapters. Revel in the way the light falls in most unexpected patterns. May we be lifted into the realms of that-which-knows, and is beyond, us. As I read Virginia's words about the immense window that this full moon total lunar eclipse in Aquarius is, I think of the characteristics of Aquarius to be creative, imaginative and forward thinking - so forward thinking, they are revolutionary. Where are YOU being called to be more revolutionary? More radical? Where are you yearning to stretch your imagination for your individual experience and our collective human experience? When I got back from Taos, I went directly to the Omega Institute for Radical Dharma Camp: Talking Race, Love and Liberation lead by Rev. angel Kyodo williams, Jasmine Syedullah Phd, and Lama Rod Owens. There were many powerful things shared, but I want to share with you this checklist they offered us to assist our imagination of a better world. 1) A Contemplative Approach: You must have an ability to touch into your internal world and the intention to merge with the external world. You must know how to slow down, observe, and be better at being in relationship with others. 2) Embodied Practice: Much of the world is stuck in a dichotomy of ideology. How do you move past that? EMBODIMENT! When you truly and deeply feel the matters at hand, you become more empathic. Instead of minimizing the issues of the day into fleeting thoughts, take time to deeply feel where the oppression, struggle, and injustice lives in your body. While your experience will be different from those most marginalized, draw from your own lived experience as a way to relate to others through feeling. 3) Liberatory Path: Be Inclusive, not exclusive. True liberation does not draw a line that it is only for some people and not for others. Be aware to not adopt the same violent techniques of oppression one is oppressed by. Notice the ways in which we are all collectively affected by systemic oppression and injustice. The work it will take to liberate black lives will liberate the whole society. 4) Prophetic Practice: Be so grounded in your body, personal spiritual practice, and this particular moment in time that you develop a deeper awareness of subtlety and nuance. You step into the complexity of these issues and become accountable for telling the truth of these transformative times. Notice what is being called for, where we are, and what you're being called to do. With clarity, speak truth into this world. 5) Collective Process: Your process must truly support the individuals involved relating to one another horizontally vs. in hierarchy. Imagine that! Can you? Will you? Beyond imagining in your mind, is there a place in your body where you feel the potential that lives in the world because it lives in you? Now is the part of the new moon or full moon blog where I hope to successfully encourage you to embody the theme of whatever we are talking about, because the inspiration and imagination of positive transformation is most powerful when it is FELT. Eclipses are said to set the energy for the next six months. What seeds are you open to imagining now to live into over the next six months? Part Two: Part the Veil. This is a new thing I have been doing in my Qoya classes lately. Put on a song and start to move, then any time you feel a block, imagine it as a veil. With your hands, part the veil, and step through to continue your movement until you feel another block. The focus for this movement is to explore the immense window for you during this eclipse. What does it feel like? Anytime you feel confused, blocked, disconnected, or unclear about it, imagine a veil is in front of you. Part it with your hands and step past it. Notice what emerges in your body as you do this. Whatever emerges, this is your work! Here is a short 10 second video to see the movement to use anytime you feel called to step through the veil, and here's a playlistof some song suggestions to part the veil to. A common reason people don't nurture their imagination and step in the direction of the revolution they're called to is...exhaustion. In case that applies to you, perhaps you can set the intention for a 10-minute nap that feels like 10 hours, then go into your movement when you have a little more energy. May the movement be as energizing and restorative as rest itself. May the immense window before you be full of positive transformation for all. For anyone reading this who has benefited from the healing container of Qoya when coming together through movement and ritual to explore the remembering of our truth in community, I am so grateful, and I wish that for everyone who desires it. I am so inspired by this Healing Justice project "created by a team of Black women artists, healers, activists, and cultural workers who all exist at the intersection of multiple marginalized identities" that I donated the fullest amount I could afford. Remember - even a little bit here and there can go a long way when we work together! At a time when black women like Nia Wilson are senselessly murdered in the USA, the relevancy of black women holding healing space for themselves and others is paramount. In the words of one founder, Ratasha Elise, "Our healing justice work encompasses racial justice with a focus on equity, gender justice, and economic justice. Applying a holistic lens, we are integrating life-giving tools and methodologies to support our own healing, wellness, empowerment, and community building. We are literally transforming the world, beginning with ourselves." To support this project, click here and donate before July 31st. To offer some extra astrological support through this major eclipse season, enjoy a 55% discount off our online course, Embodied Astrology. Through 12 Qoya movement rituals with an accompanying workbook, instructional videos, and exercises, you will integrate the wisdom of astrology in a totally personalized way by embodying its archetypes. Theme: Taking Time to Dream. Rise up from your daily life and explore your relationship to taking time to dream and vision for yourself and for our world. We live in a dream drought, where we not only forget our dreams at night, but forget to actively dream during the day. Let us strengthen our vision by dreaming together. Location in Chelsea neighborhood of Manhattan will be emailed upon registration. Closest subway stop is 28th St 1 Train. South Carolina with Sara: August 5 - 11 - join the waitlist!